An image of the moon taken by Buzz Aldrin and Neil Armstrong in July of 1969. The "Man in the Moon" illusion, familiar to various cultures around the world, was created by powerful asteroid impacts that rocked the satellite billions of years ago, a new study suggests. The study, performed by Laramie Potts and Ralph von Frese of Ohio State University, reveals that ancient lunar impacts played a much larger role in shaping the Moon's surface than scientists had previously thought. It may also help explain the origins of two mysterious bulges on the Moon's surface. The new analysis reveal that shock waves from some of the Moon's early asteroid impacts traveled through the lunar interior, triggering volcanic eruptions on the Moon's opposite side. Molten magma spewed out from the deep interior and flooded the lunar landscape. When the magma cooled, it created dark patches on the Moon called "lunar maria" or "lunar seas." During a full Moon, some of these patches combine to form what looks like a grinning human face, commonly known as the "Man in the Moon." The man's eyes are the Mare Imbrium and Mare Serenitatis, its nose is the Sinus Aestuum and its grinning mouth is the Mare Nubium and Mare Cognitum. The effects of some of those traveling shock waves are still visible in the Moon's interior today. Cross-sectional images of the insides reveal that a part of the mantle, the section between the Moon's core and crust, still juts into its core today, 700 miles below the point of one of the impacts. The images were created from data collected by NASA's Clementine and Lunar Prospector satellites. Early surveys by the Apollo missions revealed that the moon isn't a perfect sphere. There is a bulge on the Earth-facing side, called the near side, and another bulge on the far side. According to one hypothesis, these bulges are the result of Earth's gravity tugging on the Moon during the early years following its cataclysmic formation, when its surface was still molten and malleable. The current study suggests that this scenario is only partly correct. The researchers think the Moon was struck by at least two very powerful asteroid impacts in its past (in addition to countless smaller impacts that left smaller craters easily identifiable still today). One of the major impacts struck the near side, sending shock waves that traveled through the lunar interior to create the bulge on the far side; the other impact struck the far side and created the bulge on the side. The researchers think the impacts happened about four billion years ago. At that time, roughly half a billion years after the birth of the solar system, the Moon was still geologically active and its core and mantle were still molten and malleable. Back then, the Moon was much closer to the Earth than it is today and the gravitational interactions between the two were much stronger. The researchers think that when magma spilled out of the Moon's interior, Earth's gravity immediately grabbed hold and hasn't let go since. 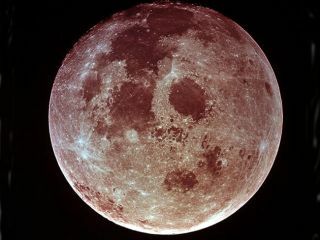 "This research shows that even after the collisions happened, the Earth had a profound effect on the Moon," Potts said. The findings were detailed in a recent issue of the journal Physics of the Earth and Planetary Interiors.